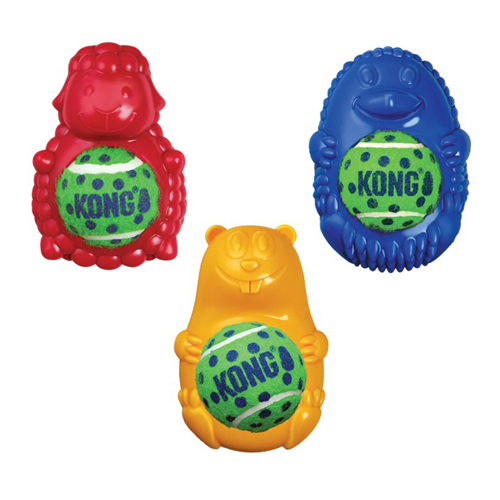 The KONG Tennis Pals are a combination of two toys: a tennis ball and a squeaky toy. This toy is perfect for fetching games. The KONG Tennis Pals are a combination of two favourite dog toys: a tennis ball and a squeaky toy. The toy and the ball can be used separately, but the tennis ball also fits in the toy. Besides fetching the Tennis Pals, getting the ball out of the toy is an extra challenge for your dog. The KONG Tennis Pals are available in three variants and are delivered in two sizes. Please note: This product is delivered at random, you cannot select your colour. Have you used KONG Tennis Pals before? Let us know what you think about this product.